I am going to be brave. Really brave. I am going to propose what should be in the next budget. Now I don’t have access to the Government Budget Office or Treasury so I will have to give some general comments rather than quoting figures. What we receive from government at present is more than we fund through taxes. That has to change. We either give up some of what we receive, or pay more taxes. We are living beyond our means. The budget debt situation is not critical or a crisis. Compared with other countries, our level of debt is quite low. We need to have a plan to get out of debt, but it does not mean we have to get out of debt over the next three or four years. In boom times, governments should not be dishing out money through tax cuts and handouts to particular groups. They should be squirreling the money away for a rainy day. Conversely, in hard times, the government should be using it’s savings to stimulate the economy. It may be an extreme example, but by pumping money into pink batts and school improvement, Australia dodged the GFC. Instead of business grinding to a halt, there was suddenly a flood of building work. That money is not just paid once by the government. The person who does the work, uses those funds to buy goods and services. The companies selling goods and services employ people to meet the demand and so it goes. The last budget failed largely because it was unfair. Any cuts need to be spread evenly over those best positioned to absorb the impact. Remember the role of government is to re-distribute money, not to tax with one hand, and hand it back to the same people with the other. So what do I believe we should do with revenue collection? Here are some thoughts to increase revenue. I fully support the Henry Report and the Greens policy of changing the 15% tax rate on superannuation contributions to a scaled approach. The more you earn, the more tax you pay on super contributions. Remove the use of super by high income earners as a tax minimisation vehicle. Put a ceiling on the amount of money you can have in superannuation. The purpose of super is to fund your retirement. How much is a reasonable amount to fund your retirement? It is certainly not tens of millions. Also on super, remove the transition to retirement provision that allows you to take money out of your super from 55 and pay the same amount back in from your salary avoiding tax. It makes no sense. Begin a concentrated legal and accounting project to address companies moving money offshore through dodgy loans, transfer pricing, and tax havens. Business will fight every inch of the way, which is to be expected. They would be negligent if they did not try to maximise profit. That is their job. Just remember everything they say is through the prism of self interest. Announce a scaled reduction to negative gearing. It may take decades to extract negative gearing from the landscape, but we need to make a start. It may be a 1% reduction per year, but send a signal to people currently using the mechanism that they need to extricate themselves from it over the next 5 to 10 years. Review current income tax rates and look at a new high rate that kicks in at somewhere between $300k and $500k. Maybe a rate of 48%. More importantly, make sure it applies to bonuses, share issues, options and all the other perks Australian highly paid executives receive. Increase the Medicare levy from 2% to 2.2%. One universal demand from Australians is for free basic medical coverage. Over time we need to match the income to the escalation in costs of modern medicine. This should be an infrastructure budget. We need to identify some infrastructure projects that will provide lots of jobs and keep a lid on unemployment. Invest in the future of Australia and bring back some confidence into the country. Pour some money back into the ATO to fund their review of businesses moving money offshore. It may turn out to be revenue positive. What they recover, may exceed what it costs. Increase funding for training. Select courses that have a job at the end. Things like aged care, child care, and skills required for the NBN rollout come to mind. The bottom line is that 30 or 40 years ago, companies took on people with no experience and trained them as apprentices or trainees. Today much less of that is happening for various reasons. Government has to takeover this role. Reorganise childcare so that it is means tested. I don’t know the formula, but someone earning $30k and someone earning $200k a year can use the same childcare center. There is no restriction on the wage you earn when your child is enrolled in childcare. There may be cost factors related to hours and location but the effort to look after a child in the eastern suburbs of Sydney and in the western suburbs is the same. There needs to be some incentive to work. That means you actually take home a reasonable chunk of your wages after paying for childcare. The more you earn, the less subsidy you are entitled to. I already proposed this in a previous post Foreign Real Estate Buyers that we allow foreign investors, but they must sell their property to a first home buyer within a period of time e.g. 5 or 10 years. In this way you still encourage investment in new home building, but also create a two tier property market where first home buyers find it more affordable to get into the market. Does it matter if the budget is balanced? No. It is more important right now to get the economy working rather than to balance the budget. That means creating jobs, and getting people off unemployment and trained to take those jobs. It means making it attractive for mums to return to work. It is about companies paying their fair share of tax. Most importantly it is about getting confidence up. Once the economy picks up, we can start to focus on reducing the deficit. Can it be sold to the public? I believe so. It needs calm rational explanation by a government to explain what they are doing and why. You need to focus on key revenue and expenditure items and not create a minefield of minor changes that take the focus away. When the front page of a newspaper runs stories of how a few hundred thousand were cut from somewhere and it will cause the end of life as we know it, how can you cut through with the big picture? Don’t tweak and trim. It is a distraction. Focus on half a dozen key areas and explain them to people. Tell them why it is a benefit. Explain how a deficit is not going to have the country declared bankrupt. Explain the purpose of a deficit, and how it can boost the country. Will anyone take notice of a suggested approach like this? I doubt it. Easier to engage in political trench warfare using traditional arguments. Deficits are bad. Taxes are bad. Money that finds it’s way into my pocket is good. 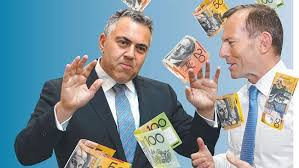 I fear when the budget does appear in May, it is likely to be another grab bag of badly thought out ideas that will do nothing to boost the economy or make the life of the average Australian any better. Remember the last time we engaged in trench warfare was World War I. Millions died. Trench warfare is 100 years out of date. Our approach to budgeting is also getting out of date.